Olexandr Omelchenko, as Mayor, has turned Kiev, with its ancient history and culture, into the one city that most deserves to be called the capital of this independent European state  a city that was acclaimed ‘the pearl of Europe’ at the Palace of Europe photo exhibition in Brussels. But it has been a difficult task. When he was elected mayor in 1996, Kiev was in crisis, caused by the disintegration of the Soviet Union and the dismantling of an ineffective socialistic command-administrative economy. Courage and exceptional professionalism was required of the city authorities to tackle ambitious projects. Over those years the people of Kiev realised that their city was in ‘safe hands’. Devotion to the charismatic mayor, who put the interests society first, repeatedly expressed itself during the elections, when the percentage of supporters reached 70 per cent. This was confirmed by the state conferring the award of ‘Hero of Ukraine’ to the mayor and his team. The name of Omelchenko is particularly associated with the renewal of ancient and famous cathedrals, the city’s heritage, that were ignored and neglected under Communism, as well as the renovation and alteration of the central square into the majestic Square of Independence. To make a society wealthy is not enough - it is of equal importance, if not more so, to make it spiritually and nationally conscious. This natural leader’s qualities have demonstrated in practice the truth of his thesis  ‘a city that is being rebuilt means it is alive’. Scaled construction of all kinds, according to the principles of sustainable development, has created a feeling of good future prospects for the population, in turn attracting new investment. Among the large-scale investment projects are the reconstruction of the city’s main street, Khreshchatyk, and the main square, the Square of Independence, freeing the centre from industrial enterprises. Then there has been the reconstruction of the massive, ugly and cramped apartment blocks of the 1960s; the building of a modern seven-kilometre bridge; and the reconstruction of the international airport and embankment. Kiev has succeeded in creating a favourable investment climate for all kinds and forms of business over a short time. Despite intensive reconstruction, Kiev retains its unique charm as one of the greenest cities in the world, with parks, public gardens and reservoirs abounding in their hundreds. Over the past ten years not a single technogenic failure has occurred in Kiev. 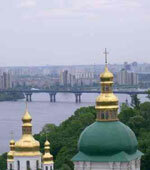 A city thrives in conditions of political and social stability, including religious tolerance, which was acknowledged by Pope John Paul on his second visit to Kiev. Ukraine’s capital, in its journey of revival, has shown unprecedented high rates of industrial growth from 4 per cent to 26 per cent annually  undoubtedly the achievements of Olexandr Omelchenko and his team. Deeply aware of the importance of local government, he initiated and became the main participant of the All-Ukrainian Movement for the Rights of Local Self-government. Olexandr O. Omelchenko was born on 9 August 1938 in the village of Zozlov, Lipovetsk, in the district of Vinnitza. In 1956 he finished his education at the Brusilovka Secondary School and was admitted to the Kiev Construction Technical School, leaving in 1959. In 1974 he graduated from the Kiev Engineering-Construction Institute and in 1978 from the Kiev Institute of National Economy. In November, 1989, he publicly defended his degree thesis, graduating at a high level in engineering science. He began his working career in 1959 at Kiev’s industrial construction complex, the Kiev Region Trust. Between 1961 and 1987 he worked at the municipal holding company GolovKievbud, where he rose from shop foreman to the first deputy head of department. During 1989 he worked as a senior engineer of Ukrbud in the City of Kirovakan (Armenia), working on the consequences of earthquakes. Between 1987 and 1989 he was a military adviser in Afghanistan and between 1989 and 1990 he was a director of the department of construction industry, in industrial building materials and standardisation, at Derzhbud in the Ukrainian Soviet Socialist Republic. 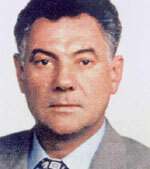 In the years 1990 to 1992 Mr Omelchenko was the deputy head of Kiev City Executive Committee, and later, until 1994, he was the general director of the state public utility Kievreconstruction. In May, 1996, he was appointed the Deputy Head of State Administration for the City of Kiev, and since June, 1996, he has been the city’s First Deputy Head of State Administration. He is a member of the Co-ordinating Advisory Board on domestic policy to the President of Ukraine and the Co-ordinating Advisory Board on the local self-government to the Cabinet of Ukraine. He is the president of Association of Ukrainian Cities and Societies, and a member of the Supervisory Board of the National Fund of Social Defense of Mothers and Children - "Ukraine to children". He is also president of Ukraine’s Federation of Hockey. In August, 1996, by Presidential decree, Mr Omelchenko was appointed the Head of State Administration for the City of Kiev. On 30 April 1998, by majority vote, he was elected the Head of the Kiev City Council. On 31 May, 1999, he was elected mayor. Mr Omelchenko pays special attention to city development and the need to preserve its historical image, blending this view with the need for modern social ideas and new and effective infrastructures. He controls the establishment of kindergartens, secondary schools, hospitals, and activities in other social and cultural areas. The improvement of transport services is a matter of permanent concern for Mr Omelchenko, especially the development of the metropolitan railway. Under his direct guidance the reconstruction of famous historical sites such as the Cathedral of Kiev-Pechersk Lavra and the Mykhailovsky Zlatoverchy Monastery have been carried out. His organisational skills and talents in construction were realised in the reconstruction of the Culture Palace of Ukraine, the building of the National Philharmonic Hall, and The Square of Glory, Pochtova Square. Order "Sign Honor", the order of a Labour Red Banner, Honorary award of the President of Ukraine, highest award of the country - Order “Hero of Ukraine” (in the year 2000). He has also been awarded numerous medals.